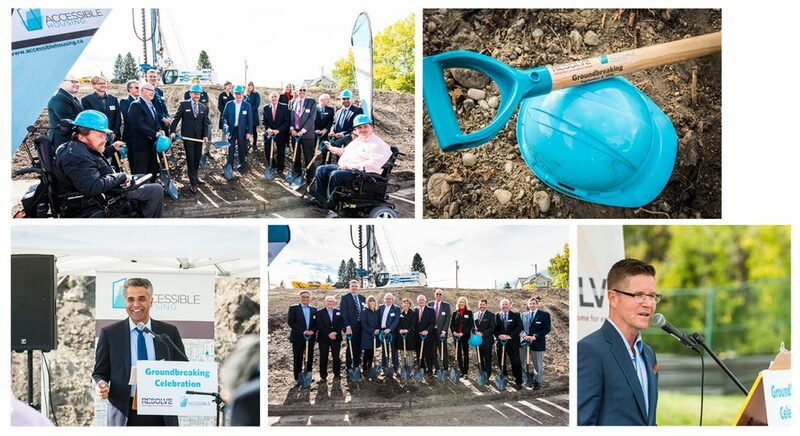 On Thursday, September 8th, 2016, Accessible Housing hosted a celebration of our RESOLVE project, a new affordable and accessible home for 45 Calgarians with limited mobility. Located in Capitol Hill, Accessible Housing and RESOLVE will build on land Accessible Housing currently operates on to increase the previous 11 units to 45. The new barrier-free building will offer multi-purpose rooms, office space, a commercial kitchen and underground parking; close to public transportation and amenities. More importantly, this building will offer the security and stability of a home for 45 people with physical disabilities who might otherwise be forced to live in unsuitable, unsafe housing and access emergency medical services more frequently and stay in hospital for longer periods of time. “Having a place to call home is the foundation for building a meaningful life. With the creation of these unique, new homes, more individuals will be able to thrive and contribute to our community. It is a momentous first-time celebration for Calgary,” said Jeff Dyer, Chief Executive Officer, Accessible Housing. There is an urgent need for safe, affordable, permanent and barrier-free housing with supports in Calgary. Calgarians with disabilities report a significant level of concern with housing affordability and safety; of these individuals, 40 per cent are worried about not having enough money for housing. Yet, less than three per cent of Calgary’s affordable housing is also accessible. “I’m pleased to celebrate the beginning of this project that will strengthen the way we support Albertans with disabilities at home and in our communities. By working with our community partners and making capital investments in housing, our government is ensuring Albertans have safe, affordable and supportive places to call home while creating construction jobs throughout the province,” said Minister Irfan Sabir. We are truly grateful for the generous support from the Government of Alberta, R. Charlie Guille and Family, Bill Kujat and Family, Centron Group of Companies, RGO Group of Companies, BMO Financial Group, Trico Homes, and more.